The ability to remotely watch your facility from your cell phone has always been important to us, even before anyone else had dreamed of this possibility. Our customers have been watching their restaurant or bar from their cell phone since the days of the flip phone. Why do I tell you this? Because of the fact that we have evolved far beyond other solutions on the market, because we have been in this exact demographic for 15 years. Our system was one of the first to have iPhone, Android, BlackBerry and Windows Phone access, and because of that, we have been able to refine the features of each of the apps to ensure you get the best quality and framerate video possible based on your internet connection. The AVM (Advanced Video Management) system was designed with networking in mind, where other DVRs just add this function on as an extra process after the fact. By designing the platform around network access, we are able to take into account the bandwidth limitations of internet connections, screen sizes available and much more to optimize what you are able to see from your phone. 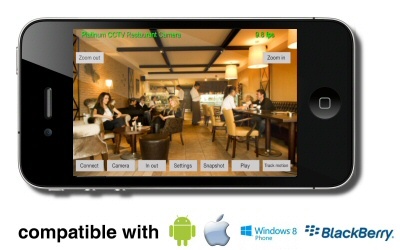 Each app allows you to connect in from your phone, and see smooth live video, adjust quality and frame rate, control any connected inputs/outputs (for lighting and alarm controls), watch multiple cameras at once, change between different numbers of cameras on screen, digitally zoom in on selected areas of the picture, save snapshots to your phone, and even playback video that has already been recorded. From your Windows computer, whether at the restaurant or halfway around the world, you will be able to have all of the same features you have if you are sitting at the restaurant on the recorder. This provides you with the full quality video, full fast playback of archives, remotely control manual recording and more. This is the best method to connect in and view your cameras if you will be playing back video, since the fast AVM archive preview is enabled on the PC client software. 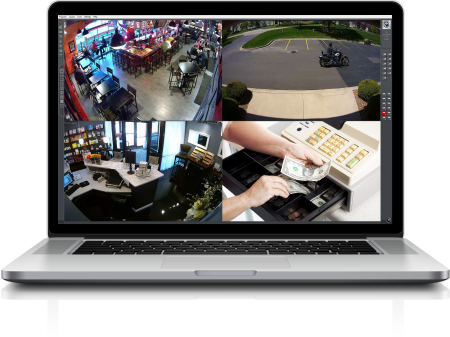 With our AVM system with CMS software for your Windows PC, laptop or tablet, you can view all of your cameras, have the same playback as on the server, it is just like you are sitting there at the restaurant. Apple users don’t be afraid, we have something for you too! Our full Mac client software will allow you access to all of the live video, as well as the playback capabilities just like the Windows PC does. This client software allows you to watch multiple locations just as easily as a single location, allowing you to setup complex layouts so you can watch your entire set of franchise locations in an easy click. 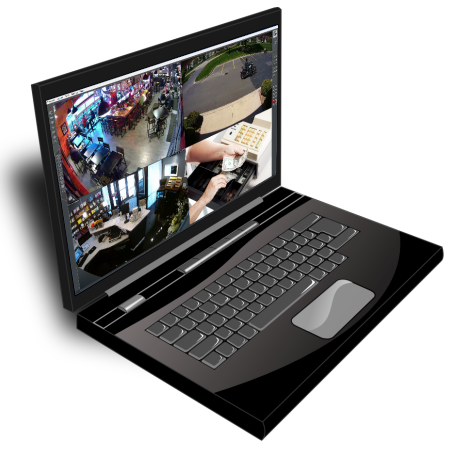 Want to have a remote backup of all of your video? No problem at all, the PC client software includes remote recording capabilities, so that you can either record the full resolution video remotely, or opt to record a reduced bandwidth or framerate stream, allowing you to keep a backup recording from any or all of your cameras. This option does not have any limitations when it comes to how long you can store the video or how many remote backups you can put in place. This is very popular for fast-food type franchises, allowing a master backup recording in real-time back to a head office. This provides instant access to the playback, and a safe backup in case a burglar decides to take the recorder from the store. Unlike “Cloud Type” recording which some systems purport to offer, our remote backup does not incur any additional monthly charges or storage charges. It uses your internet and your computer’s hard drive, so once it is set up there are no fees or charges at all. Many systems claim to have alerts that will let you know when something is happening at your restaurant. This is a true statement...kind of. They do have alerts, but they are not 'functional' for restaurant owners. The reason - These alerts are based on video motion and will send MANY false alerts, from spiders in front of the camera to headlights dancing across the screen. With most of these systems, you will get many false alarms the first night, and shut off the alerts. To us, this is not a functional alerting systems. With our AVM system, we have several methods that will allow for more specific alerts, that will limit the false-alarms and can text you when something is happening. This is accomplished through implementation of either SMART HD IP Cameras or PIR Motion sensors connected to the system. These new style cameras have intelligence built right into the camera, allowing the camera to calculate the size, shape and speed of an object on-screen and send alerts only when the specified object type enters a specific area. These cameras are a great addition to any restaurant camera system when after-hours alerts are needed. This method for alerting is a tried and true method, using alarm system style motion sensors to deliver alerts to your AVM system when a warm body is moving in an area where no one should be present. These sensors can be wired into many of the new cameras, or an alarm IO board. Either of these methods of receiving text message alerts are far more reliable than video motion based alerts that are present in most camera systems. 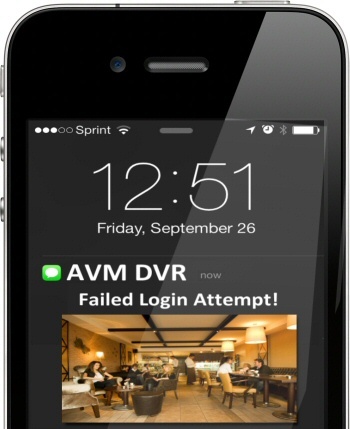 Alerts can also be delivered from the system in the event of someone trying to log into your restaurant cameras with the wrong username or password, helping you keep your system secure. Get started with a live demonstration or even a free test drive of your camera system today. We are so certain of how much value you will see in our AVM system, that we are willing to put our money where our mouth (or website) is, and let qualified restaurants test drive it for free.